A hidden gem created by architects Pete and P.B. Dye, Prestwick is one of the most prestigious 18-hole golf courses in Myrtle Beach, South Carolina. By hosting both Mid-Amateur and the U.S. Open qualifier, this course is deemed one of the most memorable and sought after courses to play in Myrtle Beach. Surrounding this course is a stunning backdrop of floral and natural beds, and a tranquil 20,000-acre lake. To accommodate most any skill level, the course features six sets of tees. The black tees offer 7,000 yards of challenge for avid golfers. At Prestwick, golfers come face to face with stairway style bunkers, domineering dunes, sandy waste areas, thick towering pines, and safeguarded greens that are only found at this club in Myrtle Beach. Narrow greens will hinder your shot at the 2nd hole, making tee shots difficult. The fairways are protected by deep sandy bunkers. To be a hit on the 3rd hole, which is the longest of the Par 4, accuracy is everything. To avoid the water hazard, make sure your tee shots stay just to the right side of the fairway. After your round, visit the pro shop. Prestwick’s fully stocked Pro Shop offers remarkable savings and deals on the best name brands in golf such as Gear, Cutter & Buck, and Ashworth. Need more convincing on planning a golf trip now to Myrtle Beach? Prestwick even offers clinics and lessons taught by PGA professionals for golfers wanted to hone your skills. Lessons are appointment based and can be held on the course or on the range. To obtain the best golf deals, book tee times at golf courses in Myrtle Beach early! One round at Prestwick will leave golfers excited to have played golf in Myrtle Beach. While visiting the Grand Strand enjoy the sand too, we have the most pristine beach in South Carolina. Beautiful course. Challenging but very fun to play. This is my 1st time to Prestwick and I absolutely loved it! Unlike where I'm from in Va Beach, va the tee boxes, fairways, rough all have grass and there is sand in the traps. It's a fairly priced course and an easy layout. Awesome round, best of our vacation. We will make Prestwick a priority next time in the area! Great layout!! Fun course to play if you're not too wild off the tee. You'd better know how to read greens and not have hands of stone because the greens are quick. Leave your ego at the car and don't be afraid to move up a set of tees too make it fun. One of the best courses in the Myrtle Beach area. cold day the greens were very fast but over all great shape. Prestwick was really good. Course was very dry compared to other courses , in the area. Greens very fast. Always a treat, to play Prestwick. Staff was very helpful. Nice day!! Wow! My 15 year old son and I played this course twice this week (Nov 3 - 10). Absolutely loved it. The greens are fantastic, fast and challenging. The course is lovely and a very challenging layout. All personnel were very friendly. Jerry, the starter, is the most genuine and nicest guy you can ever meet and chat with. Will try to play this course EVERY time I make it back to Myrtle.???????? I played Prestwick on 9/2/18, and was treated to a great experience. The bag staff offered my guest a cooler full of ice for the water that he brought. They inside staff was smiling and happy to have us at the course. During the round we we often visited by the beverage cart, and saw the ranger who offered us cold towels and ice water on several occasions. Now how about the course. Prestwick is very demanding being a Dye design, and made even harder by the perfect greens, fairways and deep rough that protected this course on Sunday. Yes, it was great, a true test of golf. Thanks again to the staff at Prestwick, a must play 5 star!! One of my favorite courses in Myrtle, it after days of torrential rain and cart path only on the other five course we played, this was 90 degrees... awesome drainage and great greens. Fun course all the way around. Course was overall in great shape with all the rain. Definitely can see all the Pete Dye trademarks throughout course. Starter was extremely helpful. Great layout and must play if in the area. Course was in overall good shape. Some mud from recent rains, however the greens rolled true and had a good pace to them. Best greens we have seen this week. This is definitely a challenging course that will make you hit some good shots to score. The rangers were friendly and very helpful. If you are making a list of places to play in the area this one should be on your list. Great course and very nice staff. I've golfed a large portion of the courses in Myrtle Beach, and somehow Prestwick had never been on that list. While staying in Ocean Lakes this summer I took advantage of discounted rates for Ocean Lakes guest, and I'm glad I did. The course was very enjoyable and was in excellent condition even though the greens had just recently been punched. Staff is very courteous and informed us that there was no water on the course but made us aware of locations that we could get bottled waters out of coolers. Throughout the round we were greeted by the Marshall who asked if we needed anything and offered water. Beverage cart girl came around several times during the round with a decent selection and a very positive attitude. I'm not so sure why I waited so long to play Prestwick, but it will definitely be a go to round each time I'm at Ocean Lakes. Beautiful course and fantastic greens! Course management is poor. We got the 1st tee time hoping to finish early and yet it still took us 5 + hours because when we made the turn we had 6 groups in front of us as they were teeing them off on the back. The group making the turn has priority but the rangers do not seem to understand that nor do they keep up with the pace of play which was slow for the amount if people there.. But again the course is in great shape. 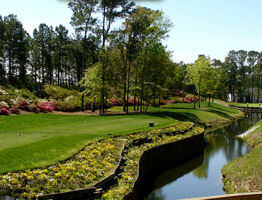 Dye, Prestwick is one of the most prestigious 18-hole golf courses in Myrtle Beach, South Carolina.